A Russian crawling traction robotic system due to be trialed by the end of 2015 will be capable of being used in human-unfriendly environments, such as a battlefield, a nuclear fallout area, extreme polar night Arctic conditions or mine sweeping. The robotic platform, called URP-01G, will weigh up to 7 tons, depending on the equipment requirements and type of armor, with dimensions of about 3.5 meters long and less than 2 meters wide. The robot will carry up to 2 tons of hardware and have a maximum speed of 40 km/h. It will remain operable after a fall of up to 2 meters. The system is being developed by Russia’s Systemprom Concern, an integral part of the United Instrument Manufacturing Corporation. The producer promises that will be used in situations where human life is endangered, such as army scout-attack missions, police counter-terrorist operations, firefighting, post-accident clean-up after incidents at nuclear power plants, chemical and biological hazard reconnaissance, guard patrol functions and rescue operations. “We create several systems, said Aleksey Simulin, Systemprom’s Science and Technology department chief. Having enough power and integrated command and control systems onboard the robotic platform, “we can turn this machine into virtually anything,” Simulin said, adding that the installed payload modules could be from different producers. The URP-01G robotic platform could be transformed into an radio-electronic warfare unit or a communication repeater, which means it could accommodate a high-capacity power supply system. The developer says that the initial range of the system will be 10 kilometers from its control center, but there are plans to turn it into an autonomous system with artificial intelligence (AI) capabilities. “The machine is designed in such a way that it could be loaded into a military truck or could be airdropped,” Simulin said, adding that the company is developing the platform and plans to start factory tests by the end of this year. Another unique feature of URP-01G is its control system developed specifically for the platform. It functions without a“classic operating system,” such as Windows or Linux, and it loads to readiness in mere 1.5 seconds. All the platform’s control electronic components are produced in Russia, Simulin said, adding that the new know-how is likely to be used on other perspective Russian robotic platforms. 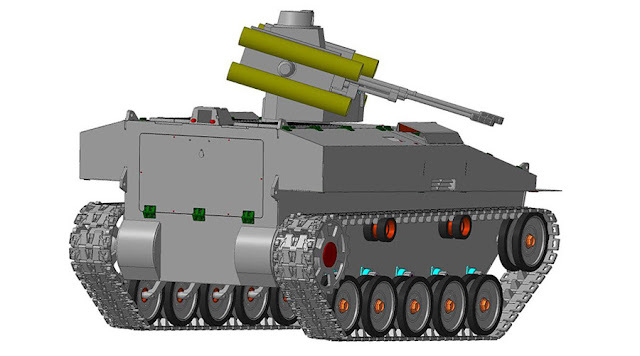 For the Russian army, Systemprom is developing two variants of URP-01G, a battlefield one armed with a heavy machine gun and grenade launchers, and a scout version equipped with a small reconnaissance UAV. The exact appearance of the URP-01G platform remains classified. Over the last couple of years there have been presented a number of track-type battle robotic systems armed with small-arms weapons and anti-tank rocket launchers. Some of them, such as Platform-M and Uran, are being actively tested in the Russian army, yet there has been no official information about the number of units purchased by the Defense Ministry.